Groundwood Books, House of Anansi Press, Toronto, 2015. 28 pages. I can’t resist the charm of this wordless picture book. We’ve got a little girl with a red hood, walking with her father, holding his hand. Her father’s talking on his phone almost the whole way. He’s not noticing at all what’s going on down at his daughter’s level. 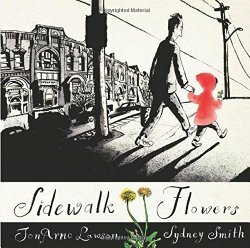 She sees flowers — growing in the cracks of the sidewalk, growing in the grass in a vacant lot by a bus stop. She gathers them. And then she leaves flowers behind with those she meets, on her level — a dead bird in the park, a man sleeping on a park bench, a dog’s collar, and, when she gets home, her mother’s hair. The two planes of action — father on phone, girl gathering and distributing flowers — are simply captivating. This book keeps pulling me back to look at it again. I’d love to share it with a child and hear about what they see. This entry was posted on Friday, May 22nd, 2015 at 10:40 pm and is filed under Contemporary, Picture Book Review, Wordless Picture Book. You can follow any responses to this entry through the RSS 2.0 feed. You can leave a response, or trackback from your own site.